Do treats-only (without needles or fluids) “treatments” in the appointed spot at the appointed time following all the routines (without the actual fluids), so they associate those conditions more with treats than with discomfort. Spend time on fun, calming activities first. I don’t want cats I visit to see me walk through the door and think that I’m going to whisk them off to jab them with a needle right off the bat. So we always spend time loving on each other first. Always do treatment in the same place and around the same time of day so they get used to the routine. Treatment seems to go better once they learn that these activities might be uncomfortable, but they’re familiar and predictable. Figure out what elevation makes them most comfortable when they want to hide, and put them at that level for treatment. If they hide in the sink at the vet’s office, I place them in the sink for treatment. If they prefer to hide down low, under beds or in crates, I place them on the floor. If they are most comfortable sitting on my lap, I put them on my lap during treatment. Prepare their favorite reward to dole out during and/or immediately after treatment. Most often that’s a tasty treat, but some cats responder better to getting a dose of catnip or a long brushing session as their reward. Or maybe it’s getting a few minutes of cuddling in front of warm fireplace or on a heated bed. Whatever their favorite treat, it’s part of the treatment process. Slowly warm fluids to room temperature or slightly above. I prefer using a heating pad or hot water bottles. I always avoid making the fluids hot and would never – under any circumstances – warm fluids in the microwave. Provide a rug with non-slip backing (like a bath rug) so kitties’ claws can get a grip on something without them having the scary feeling of slipping around. Cover the cat with a blanket so they feel like they’re in a safe hiding place. This doesn’t work for every cat, but for some cats it immediately calms them down. Do light compression to help reduce stress and anxiety. This is not the same as hugging or squeezing them. Before trying this, please learn how to properly use compression from an animal health professional. Spritz the treatment area with pheromone spray (Comfort Zone by Feliway) several times daily, beginning the day before treatment. Note: there are many “calming sprays” on the market that are not labeled as containing pheromones, such as NutriVet brand. Talk or sing softly during treatment. I like letting anxious cats know where I am at all times because they won’t feel the need to remain alert to avoid having me startle them. Offer them calming treats (Pet Naturals brand makes my favorites) before we get started. Perform a little TTouch massage. I highly recommend taking a class with Marnie Black, who is licensed in Small Animal Massage. Plan in advance to give them a flower essence for trust, bravery, or anxiety relief. Ideally, I do this several times daily, beginning the day before treatment. I use a custom blend made by Lin Gregerson. The general Rescue Remedy blend is easy to find in stores, but tends to cost more per ounce than Lin’s custom-made blends. Sterilize using colloidal silver as the antimicrobial on their skin. Wiping their skin with alcohol makes it sting when needles are inserted. Not so with colloidal silver. Have a bowl or sachet of dried lavender or chamomile nearby. Scented oils can be used, but many of them include neurotoxins, so I prefer to go a more natural route. Use a pink blanket when covering them and a pink non-slip rug. There’s a lot of evidence that pink has a calming effect on mood. Play quiet, relaxing music before and during treatment. Many studies have found that some music has a calming effect on animals, including humans. Do surrogate EFT / Tapping. If you already know how to do this for yourself, I highly recommend learning how to do it as a surrogate for an animal. I’ve taken a class and had tutorials by a local EFT For Pets expert Lin Gregerson. I also highly recommend attending Val Burke’s EFT groups and private sessions. Start doing light compression, TTouch massage, and/or EFT several hours before treatment in addition to treatment. Try communicating with them using techniques such as those taught by Lisa Holm, a local pet communicator. File this under “well, it can’t hurt, so why not give it a try”. Consult with a pet communicator. I’ve had mind-blowing success with Lisa Holm, although I haven’t worked with her specifically to help a cat understand the sub-Q process. I’m a huge skeptic but Lisa has stunned me into speechlessness with the details that come out when she talks to my cats, so I’ve continued to work with her at times. Delanty, Laura. “Sophia gets her subcutaneous (sub-Q) fluids”. We love cats. 22 Dec 2014. Feb 2008. Elliot, AJ and MA Maier. “Color and psychological functioning”. Current directions in psychological science. Vol.16 issue 5: 250-254 (2007). 28 Dec 2014. Accessed through ProQuest. Jallais, Christophe and Anne-Laure Gilet. “Inducing changes in arousal and valence: Comparison of two mood induction procedures”. Behavior research methods. Vol.42 issue 1: 318-325. (2010). 28 Dec 2014. Accessed through ProQuest. Rodan, Ilona. “Understanding feline behavior and application for appropriate handling and management.” Topics in companion animal medicine Vol.25 issue 4: 178-188. (2010). 28 Dec. 2014. Accessed through ProQuest. Saunders B. “What is color: Man’s perception of colors”. British Journal of Psychology. Vol. 89: 697-704 (1998). 28 Dec 2014. Accessed through ProQuest. Great article Kari! I had a big red tabby named Tig who was on sub-Q fluids for a few months. We struggled with a rig at home, something to hold the IV bag up high enough to generate a good flow rate. Not only should the kitty be comfortable, but the more comfortable you can make yourself, the better it goes. After all, animals react to their humans’ stress level. I’m a nurse by trade, and even for me learning to do the sub-Q on a kitty was an anxiety-provoking adventure. Side note… take some of the de-stress formula yourself if the fluid treatments stress YOU out! 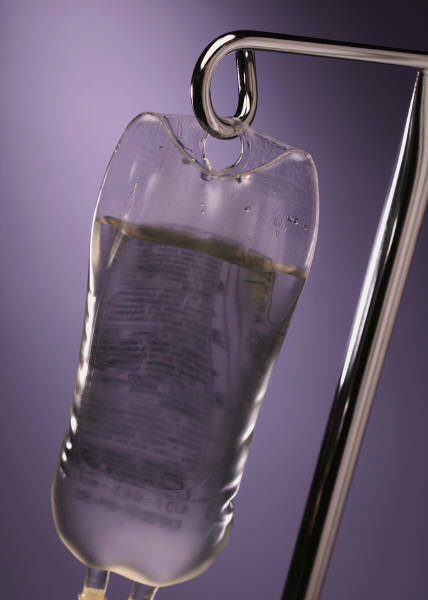 I solved the fluid bag-hanging challenge by hanging a decorative metal hook on the living room wall behind the sofa, which you would never know was an IV bag holder. It worked beautifully. That way, we could be in our favorite quiet area in nice lighting, watching tv or whatever, on a comfy sofa near the throw blankets. When the fluids bag came down, a nice little wall hanging took its place. I also found that tapping helped both me AND Tig with coping with his final months and the emotional ups and downs that come along with helping our pets live out their lives with comfort and dignity.